Anyone stopping by to share a meal Sunday at the First Presyterian Church of Oak Ridge could find a flyer explaining “we put meat on our prayers.” These churchgoers spend only a tiny part of their “church” time sitting quietly in pews. 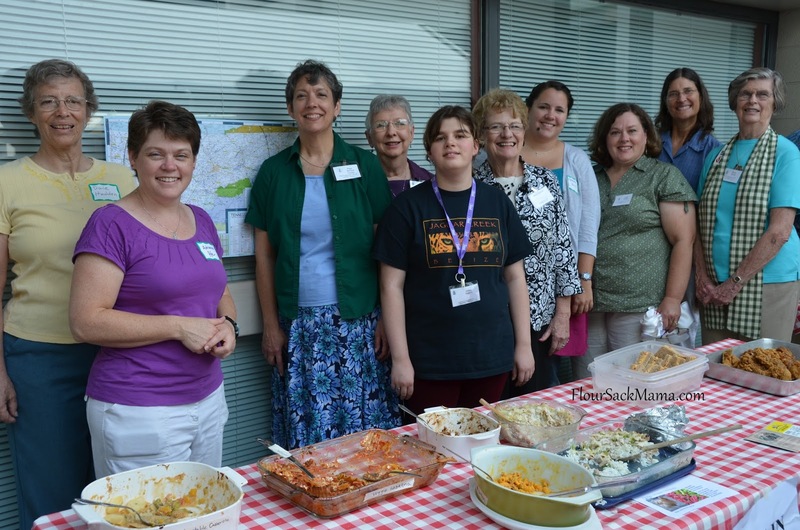 Even the 100-Mile-Potluck was not your typical church social. It was an event designed to engage people actively in the wider community. FPC Paster, the Reverend Sharon Youngs was encouraged by the turnout, despite the morning’s heavy rain showers. The community-wide lunch followed an ecumenical worship service at another church in town. Tomatoes and greens, sandwiches and homemade sweet breads, summer’s last sweet watermelon — tables full of food were blessed and then quickly devoured amid talk of people looking forward to the rest of the Creation Care themed day. The potluck goal was that each dish shared would include at least one food ingredient from within 100 miles of the small East Tennessee town. People were encouraged to bring their own reusable dishes or use compostable ones to prevent waste. Youngs shared, “When we grow our food locally, it’s cutting down on fossil fuel consumption and helping us to be good stewards on God’s earth.” Youngs praised the large team who planned, organized and cooked to make the event a success. 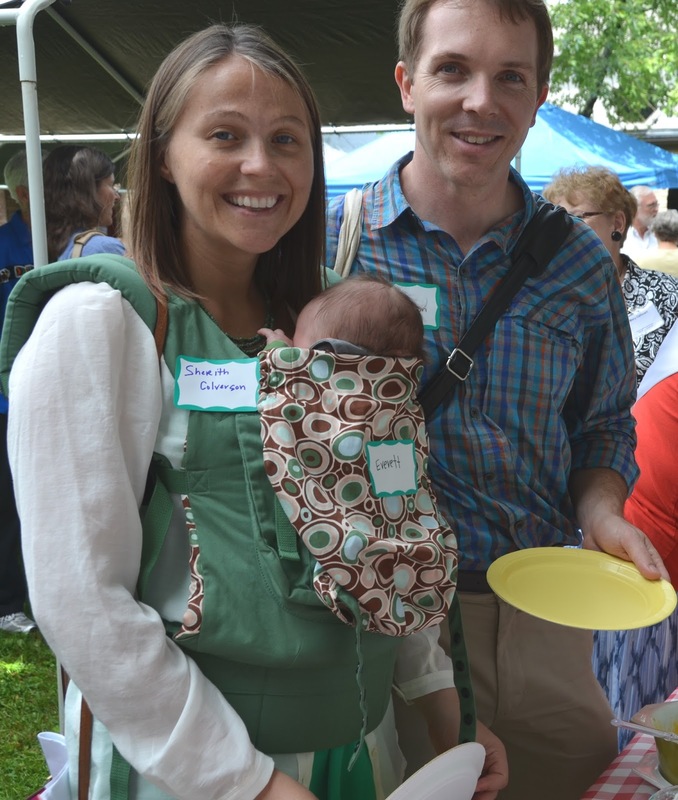 Church members Collin and Sherith Colverson were excited to see the emphasis on Creation Care, especially given their focus as a young family on their infant, Everett. “I would love to be able to have clean air for my child to breathe,” shared Sherith, understanding the connection between food and the pollution caused by transporting that food long distances. Even if the Colversons live out their Christian faith with mindful choices like local food, their individual actions are not enough to stop the real threat of air pollution from harming their child. This church and others around the country are joining what they see as a “prophetic call” to divest from fossil fuels, because science shows even beyond our immediate concerns like pollution, the fossil fuel industry threatens the planet’s ability to sustain life by disrupting the climate. Church member and University of Tennessee researcher Dan Terpstra is concerned that not only will future families be at risk because of climate change, but that other people around the globe are already paying a heavy price. “It really truly is a justice issue,” Terpstra explained. “It’s cross-generational justice issue and it’s an economic justice issue when we in the first world have been stealing resources from the third world and it’s time that we deal with these issues responsibly.” You can learn more about the Fossil Free USA movement within the Presbyterian Church at this link. Terpstra felt so passionate about sharing this climate change message that he spent three years inviting a special guest speaker to his hometown.What happened when that invitation was finally accepted?